Dipartimento di Scienze della Vita, Università di Trieste – Progetto Dryades – Picture by Andrea Moro – Image licensed under a Creative Commons Attribution Non Commercial Share-Alike 3.0 License. luirig.altervista.org. 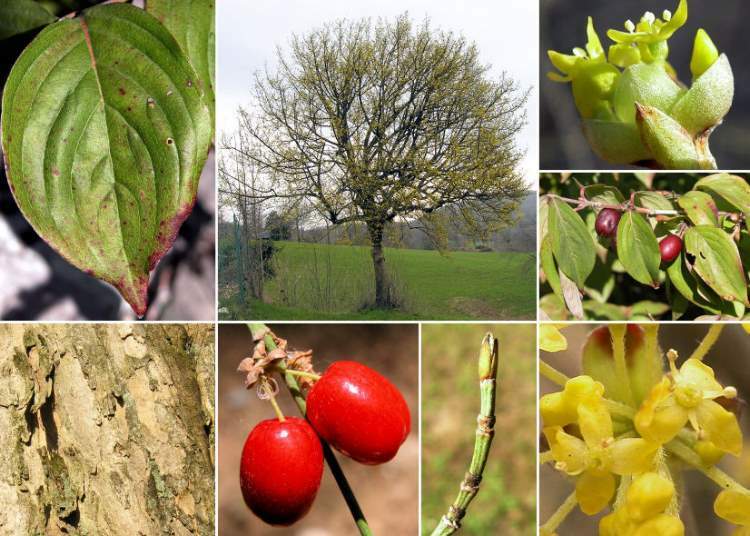 Cornus mas is a small tree or multi-stemmed shrub to 6 m tall; bark flaking and peeling, brown; young twigs angled, green, reddish above, winter flower buds in axils rounded, yellow-green brown; leaf buds greenish, silky, vein scars 3 (use lens), Petrides 1972). Leaves opposite, egg-shaped to elliptic, to 10 cm long, 3 cm wide. Flowers yellow, four-parted, small, in March before leaves (earlier than Spicebush). Fruit bright red, fleshy, about 1 cm long, smooth, 1-seeded, edible when cooked, July (Dirr 1990). Habitat: Horticultural, especially along highways, sometimes escapes into natural areas, or plantings become overgrown.